The Biological Sciences Club will be holding its first meeting of the year today – Monday, September 5 - at 6:00 p.m. in Room 102 in the Koch Center for Engineering and Science. Join the group for pizza while learning about events planned for this semester. Venturing Crew Open House is tonight! Join the members of Venturing Crew for their open house at 7:00 p.m. tonight in Room 251 in Eykamp Hall in Ridgway University Center. Come to learn about all of the exciting events planned for the semester and to meet members of the crew! If you love the outdoors or you are a current member, you are encouraged to come to this event. Sign-ups for the crew will be available as well as membership renewals. To officially join this outdoor club, there is a $25 fee and you will need to complete a registration form. T-shirts will be for sale at the event. The shirts are a deal at $5 at this open house. They cost $7 at any other time! Nalgene water bottles will also be available for sale at $9. In addition, you will have the chance to begin signing up for some of the group’s first events. First PRIDE meeting of year is planned for today! PRIDE's first club meeting of the year will be today in Room 250 in the Schroeder School of Business Building from 9:00-10:00 p.m. However the group will first meet next to the fountain in Ridgeway University Center for those who don't know how to get to the room. PRIDE is the campus LGBTQ+ group, and allies are welcome. Come on out for a night of introductions and maybe a game. Burn some calories and save the world! Join us on Saturday, September 10, at 8:00 a.m. at USI to help raise money to support Road to Mafraq, a non-profit dedicated to providing education for Syrian refugee children living in Jordan. Activities at the event will include a 5K run as well as a 1-mile run/walk in addition to a community fair. Use this link to sign up or go to the Scholars for Syria Facebook page for the event announcement. The Department of Music kicks off the academic year and this year’s First Tuesday Concert Series with the annual Fall Faculty Gala in Wheeler Concert Hall in the Krannert Hall of Fine Arts today - Tuesday, September 6 - at 7:30 p.m. The concert will feature selections from several works, ranging from the nineteenth century to the modern era, performed by Department of Music faculty members. The concert is free and open to the public, as are all Tuesday night faculty recitals throughout the year. For information on future events, consult the Concert Calendar on the Department of Music’s website. It's I-House time again! Rebecca Nelson and Kudzi Mandingwa will be making a presentation about their country of Zimbabwe tonight at 7:00 p.m., upstairs in Ridgway University Center. Rebecca is a biology major and Kudzi is a computer science major. Rebecca loves hiking, kayaking, and reading. Kudzi likes to swim, watch Harry Potter and Sherlock Holmes, hike, and listen to music. They both love the people here and the school pride that UE has. On Friday, September 9, the University of Evansville’s Office of Diversity Initiatives and the Center for Student Engagement is planning a trip to visit the historical Lyles Station. The bus will arrive on campus at 5:45 p.m. and depart by 6:00 p.m. The trip will conclude at 8:00 p.m. and the bus will arrive back on campus at 8:45 p.m. There is no cost for students. Faculty members, staff, and friends pay $5 dollars. All participants will receive a box sandwich meal with drink for the trip. Have you ever sensed something wasn't quite right with a friend? Ever felt you needed to say something and weren't quite sure what to say? We can help! UE Counseling Services will be hosting a walk-through event to acknowledge September as Suicide Prevention Awareness Month and to provide you with the opportunity to "B1" for a friend! Learn how to be aware of this silent epidemic, be able to identify the warning signs, and be prepared to react when you know a friend may be in need of help. Counseling Services will have a table downstairs in Ridgeway University Center on Thursday, September 8, from 11:00 a.m.-1:00 p.m. Stop by and see us to be entered in a raffle for some UE gear! The Fall 2016 supplemental instruction schedule begins Sunday, September 5! Free tutoring is available for chemistry, biology, anthropology, exercise science, nursing, all math classes, business, quantitative methods, and foreign languages. Check out the schedule on AceLink. For more information about SI, contact Stacey Shanks, director of student success services, at ss581@evansville.edu. Are you interested in hosting a prospective student? The Office of Admission is looking for current students to help host prospective students on Thursday, September 15, starting at 5:00 p.m., for Purple Visit Day. Dinner will be provided. The students staying overnight will be doing their campus visit the following day. The TIAA-CREF representative will be on the UE campus on Tuesday, September 20, for individual counseling sessions. To schedule an appointment, call TIAA-CREF at 1-800-732-8353 or 317-706-6200. The sessions are held in the Clifford Rare Books Room of the University Libraries (Room 158). The Office of Admission would like to welcome two new employees to campus! Jill Fisher has been hired as an admission counselor with territory responsibility for Southern Illinois and most states not contiguous to Indiana. Ashley Anderson has also been hired as the new regional admission representative who will serve our growing number of prospective students in the Indianapolis area. Travel season is just around the corner, so both Jill and Ashley are ready to start their fall 2017 recruitment by hitting the ground running. The Office of Admission has also seen a change in leadership recently. We would like to congratulate Kenton Hargis on becoming the new director of admission! We look forward to recruiting our next class and continuing to welcome prospective Aces to campus. 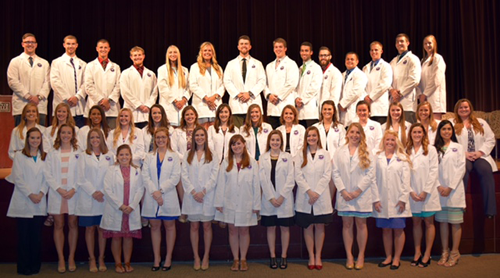 The Department of Physical Therapy welcomed the Doctor of Physical Therapy Class of 2019 at its annual White Coat Ceremony on August 23. During the ceremony, 41 first-year doctor of physical therapy students received their white coats, a symbol of clinical care and service. WFF Facility Services (on-campus housekeeping) is hiring students interested in part-time employment with flexible hours. Please reply to Kregg Woosley at 812-488-2045 or inquire at the physical plant office, located in the same building as the security office. You may also apply online here. Click on careers tab and follow prompts. The United States Postal Service will be closed Monday, September 5 for Labor Day. Please note that because of this, UE will not be able to pick up mail from the USPS on that day. Any mail picked up from UE areas by Distribution Services on Monday, September 5, will be metered and mailed on the afternoon of Tuesday, September 6. For mailing questions, contact Distribution Services at ext. 2197. Sign-ups are now available for Fall Health Screenings. Screenings will be held in the basement of Neu Chapel on Sept. 6, 7, and 8, from 7:00-11:00 a.m. To schedule your screening go to AceLink>Home>Wellness Screenings. Please do not sign up under the Employee Health Clinic. Each employee is allowed to schedule two time slots in order to schedule their spouse. Each person is eligible to earn up to $350 in HRA credits by screening. A 12-hour fasting period is highly encouraged. Water and black coffee are permitted during that time. Richard Maass, assistant professor of political science, presented a research paper titled "Command and Conquer: Ideologies of Superiority, Democracy, and Annexation" at the annual conference of the American Political Science Association in Philadelphia on Saturday, September 3. Maass's paper examines how similar ideologies of superiority can produce different foreign policies when filtered through different domestic institutions, using case studies of Nazi Germany and the US during the Mexican-American War. Peter Schmidt, associate professor of mechanical engineering, has an article titled "Residual surface stress: comparing traditional and modulated tool path machining processes" in the journal Materials Science and Technology. The article documents a study of the effect of modulated tool path machining on residual stresses found in metal parts fabricated using single point turning. Professor of biology Cris Hochwender gave an invited talk at the 10th Annual Eastern Native Grass Symposium. 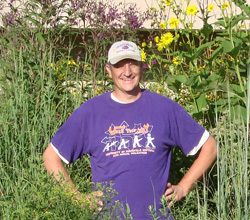 His talk, “Sustaining insect wildlife by enhancing native plant diversity,” focused on using host plants to enhance herbivore diversity (including butterfly species). Other seminars included topics on the establishment, maintenance, and benefits of warm season grasses in a variety of settings. This year’s symposium was organized by Southwest Indiana Soil and Water Conservation Districts, including Posey, Vanderburgh, Warrick, Gibson, and Pike Counties. Hanna Welch and Ricky Hendrix were the top performers as the University of Evansville Cross Country teams opened up the 2016 season on Friday at the Eastern Illinois University Walt Crawford Open. Welch led the way for the ladies, finishing the 5K course in a time of 18:48.14 to take tenth place overall out of 69 runners. She was ninth among Division I runners in her debut for the Purple Aces. Her effort was also the second-best 5K time for the squad since the beginning of last season. Five spots behind her in the final running order was Siena Crews. The sophomore circled the course in a time of 19:14.53. She came home thirteenth among D-I racers and twenty-second on the final leaderboard. Third on the squad was Ashton Bosler. Her time of 20:24.53 put her twenty-second in the D-I order. Kylie Hasenour and Michelle Karp rounded out the top five for the women. Hasenour made her college debut, finishing the race in 20:27.64 to take twenty-third. Karp was two spots behind. Her run of 21:18.19 was good for twenty-fifth. Next up was Anna Loef, who had her best 5K run in two years. Her time of 23:34.38 was 21 seconds better than her fastest race in 2015. It placed her twenty-sixth on the Division I list. Katie Beaber was just behind with a 22:37.38 while August Martinez (23:27.62) and Hayley Elliott (25:37.71) rounded out the squad. Ricky Hendrix burst onto the scene for the men, finishing his 8K effort in a time of 27:15.79. His debut time was the quickest for a UE runner since Josh Genet posted a 26:29.25 in the 2014 Missouri Valley Conference Championship. He came home in twelfth place. Just behind him was another newcomer – Stanley Chepchieng. His 28:35.05 saw him earn a twentieth place finish on the Division I leaderboard. Third for the men was Paul Schwartz. The senior set a PR with his 28:35.16. It bested his previous top time of 29:04.2, which was set in last year’s UE Invitational at Angel Mounds. Aaron Cochran was fourth for the Aces squad. In his first collegiate race, Cochran took twenty-second with his time of 28:55.66. Ross Frondorf completed the top five for UE, taking twenty-third on the heels of a 29:04.00. Tucker Dawson and Andrew Barrett finished twenty-fifth and twenty-sixth, respectively, in the D-I order. Dawson debuted with a time of 29:25.81 while Barrett completed the race in 30:14.15. Ben Woolems, Jonathan Newby and Daniel Zoufal were the other performers for the Purple Aces. Woolems ran a 31:17.96 with Newby checking in with a 32:02.69. Zoufal ran a 35:20.53. UE returns to the course on September 16 in Bloomington for the Indiana Collegiate Championships. With their first five matches taking place away from home, the Purple Aces will finally be at the Carson Center today to take on Southeast Missouri State at 6:00 p.m. The match will be the first of the season for UE as a part of The Valley on ESPN3 package. Two matches were played at the SIUE Tournament over the weekend as Evansville put forth its best effort of the season against Green Bay before playing well against the host Cougars before falling by a 3-0 score in both contests. Rocio Fortuny missed the opening weekend of play at IU, but did not show any signs of rust as she burst onto the scene at SIUE with an effort that saw her named to the All-Tournament Team. She opened up with nine kills in a career-high 32 attempts to go along with five digs and four blocks assists. Against SIUE, Fortuny posted eight more kills and five digs. Saturday’s opener against Green Bay saw the Purple Aces notch 34 block assists, finishing the day with 34 block assists, a team total of 17.0. That was the most for UE since notching 17.0 against UT Martin, three years to the day – September 3, 2013. Pacing the UE squad defensively has been junior Erlicia Griffith. After finishing with nine blocks in the IU Invitational, Griffith added eight more block assists against Green Bay. For the season, she has notched 1.42 blocks per set, second in the MVC. McKenzie Dorris of Southern Illinois leads the league with 1.44 per set. Mildrelis Rodriguez continues to be the Aces’ top offensive force. She has 38 kills on the season, an average of 2.53 per set while recording at least seven in each match. Rodriguez notched 217 kills as a freshman. Defensively, the sophomore ranks second on the squad with 33 digs, 2.20 per set. Senior Kayla Katterhenry picked up right where she left off from last season as she sits atop the leaderboard at the Redbird Invitational following two rounds of action at Weibring Golf Club. Katterhenry set the tone early, recording a 7-under 65 in Sunday’s opening round. She followed that up with a 75, and leads Butler’s Abigail Gleixner by one heading into Monday’s final round. Katterhenry sits at a 4-under 140. Lois Kaye Go of Boston College is third, three behind Katterhenry. Second on the UE squad was Maggie Camp. The senior opened the day with an 85, but improved greatly in the second trip around the course, lowering her score to a 77. Camp wrapped up the day with a 162 and is tied for sixty-seventh. Lexie Sollman was third for the Purple Aces. In her debut with the program, she posted rounds of 79 and 84 to finish with a 163 and is tied for seventy-first. Maria Pickens completed her two rounds one shot off of Sollman. She carded scores of 83 and 81. Wrapping up the Evansville contingent was Giulia Mallmann. The native of Rio de Janeiro recorded two scores of 83. Playing as an individual, Madison Chaney was the second-best performer on the day for UE. Following a 77 in the first round, she recorded a 79 to complete the day with a 156. She is tied for thirty-seventh. The Evansville squad ranks thirteenth out of 14 teams in the event with a score of 626. They are one behind 12th-place Ohio University and just five outside of the top eight as Ball State finished with a 621. An exciting battle took place at the top of the charts as Boston College and Northern Illinois tied for the team lead with each notching a 597. Florida Gulf Coast is just behind in third place with a 599. The final round of play begins today at 8:30 a.m.